Based in Los Angeles, Californa, Elizabeth Hall is a blogger, Francophile and a Le Dîner en Blanc devotee who has participated in these elegant gatherings on two continents. With the 30 th anniversary of Le Dîner en Blanc de Paris set to take place this coming June 3rd, she gives us a glimpse of the joy that surrounds this extraordinary happening and explains what makes it so special. How did you first become interested in the Dîner en Blanc? How many have you attended in LA? I was a fan of the Dîner en Blanc for about five years before I even attended an event. It was on my “life list” of things to do. I read about it from different blogs and saw videos on YouTube. I’ve attended four Le Dîner en Blanc so far, three of them in Los Angeles. You could call me the “unofficial spokesperson” for this wonderful event. Outside of LA, where have you travelled to attend a Dîner en Blanc? Aside from three events in LA, I have travelled to Paris to attend a Dîner en Blanc. It was magical. How do you explain this passion for Le Dîner en Blanc? What makes this event so special? I just like the idea that so many different people are coming from different parts of the city and have no idea where they are going, and they somehow manage to bring it all together. I love to see the creativity of the different table sets and the outfits… I have seen some CRAZY outfits: Marie-Antoinette, white Goth, a party of 20 wearing the same white wig…it’s just been amazing. People go all out. I always look forward to seeing the creativity. Would you consider yourself to be a Dîner en Blanc groupie, like some people are for singers or bands? Do you hang photos in your room, correspond with other fans, etc.? I would consider myself to be a super fan because I have just always found this to be a cool idea and I like the idea of bringing together so many different people. While I do not display any photos of Dîner en Blanc experiences in my home, I have written about it in many blog posts. I am always talking with fellow Dîner en Blanc enthusiasts/friends about the next one: how we will do the best table ever and how we are going to find the craziest headpiece, etc. We always try to outdo our headpieces every year. In 2014, you attended a Dîner en Blanc in Paris. What is your best memory from that evening? It’s so hard to choose just one memory, but I’d have to say seeing the Eiffel Tower sparkle in the background was the best. It was the first time that I had ever seen it at night: there we were, some 13,000 dining along the Seine. About 400 of us were situated on the Passerelle Debilly footbridge in two long rows of tables. Passersby asked us if it was a wedding. It was the best Dîner en Blanc that I have ever attended and, without doubt, the most surreal event of my life. When you travel outside the country to attend a Dîner en Blanc, how do you find the tables and chairs you need? And what about friends? When we travelled to Paris for the Dîner en Blanc, I brought my own roll-up table in a backpack through London, Amsterdam and Paris. I was lucky to borrow some white fold-up chairs from the rental we were staying at in Paris. As for the rest, I just brought all my previous stuff from America in my suitcases and for anything that was breakable, we purchased it the day of. The hardest thing to find in all of Paris? All-white dinner napkins. It took me hours, but finally, I found some in the Marais. We made due with what we had at the apartment and it turned out to be really nice. The only thing that went wrong was that my beautiful tiramisu got completely smashed in my picnic bag on the way there! 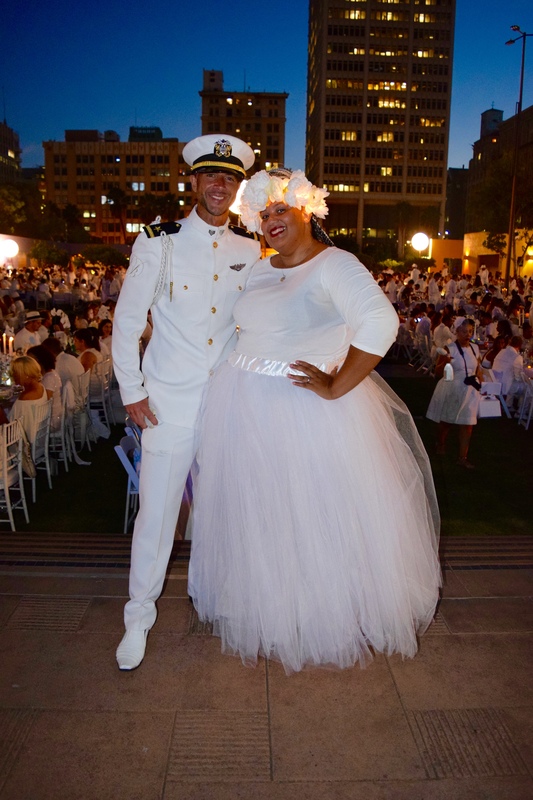 Have you made new friends at the many Le Dîner en Blanc events that you have attended? Yes, absolutely. I’ve met so many great people and am happy to count them among my friends. For example, my group leader from two years ago. And my table leader from another Dîner en Blanc: we had this immediate bond, maybe because the bus didn’t show up to take us to the location. I think we became immediate friends because of sharing this stressful situation. It was like being away at summer camp! In Paris, I even met one of my favourite TV hosts, Adrian Leeds from the HGTV show, House Hunters International; now, she’s helping us to find a place to live in Paris! You never know who you are going to meet at a Dîner en Blanc! Which is your next Dîner en Blanc? I am thrilled to say that we will attend the 30 th anniversary of the Dîner en Blanc this coming June in Paris. I can’t wait! Above and beyond the meal, what do you get out of the Dîner en Blanc? There are so many things to take away from the Dîner en Blanc. As for the meal itself, we have a few traditions, such as the ceremonial popping of the champagne by my husband. I always bring as much “white” food as I can, like sushi, as well as finger food (it’s hard to eat when everything is so exciting! I walk around and snap tons of pictures! ), a very fancy dessert, fresh flowers, etc. I try to engage with as many people as I can. What I take away from this experience is the joy of being part of a “connecting community” from all over the world. Everyone is so sweet. We come together in celebration, pure and simple.